This entry was posted in Misc and tagged Food, horsemeat, Ireland, Shopping, supermarket, Tesco by The Ed. Bookmark the permalink. Is that the Rock Ridge branch of Pony Express? Wells Fargo just a couple of doors away? 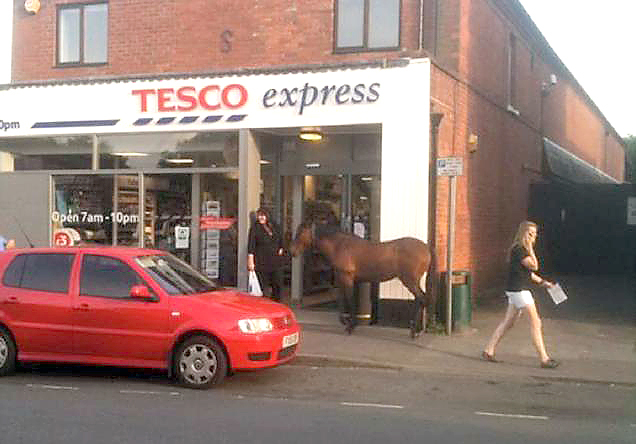 I Suspect there would be an outcry if your local supermarket’s burgers DIDN’T have horse meat in them ? Is that why supermarket burgers give you the ‘trots’? In the fridge/ freezer more traditional ,but hay( sic)..it IS Dart’ord after all…?! The ‘trap’ from pony & trap ?